Well, its time to cleanse guys. Detox they call it. To stop the binging. To start the healing. To start another year, fresh and healthy. To make resolutions – which usually don’t last more than a week 😉 Oh! We’ll save that for another post. For now, it’s time to soupify your palette. 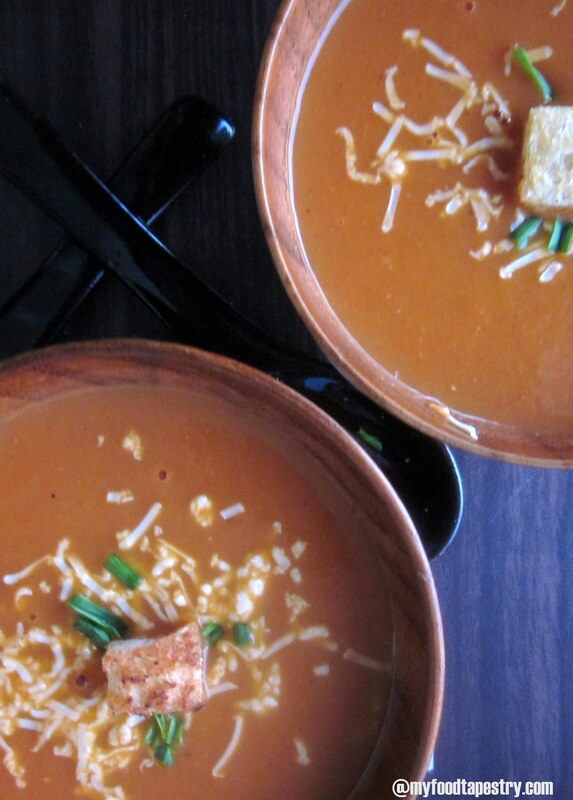 What I have here is a simple delicious luscious tomato soup recipe. 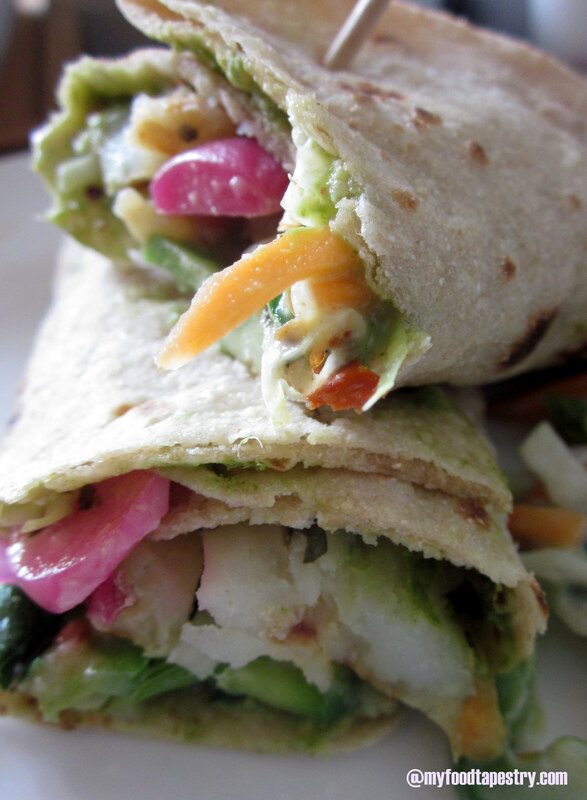 Light, flavorful and so simple, you will find yourself making it more often than required. 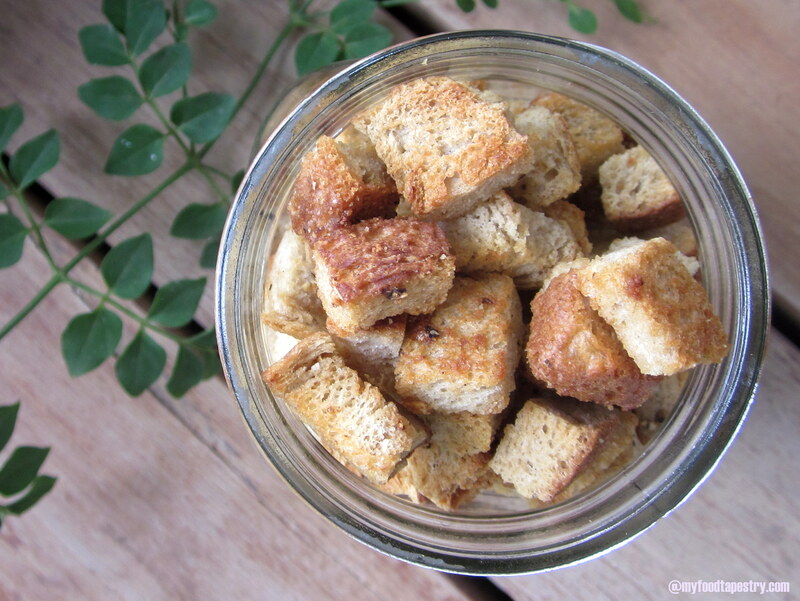 Best enjoyed with some home-made croutons or bread sticks, this one is sure a keeper. I have a little soup lover at home. Along with the love comes the pricky palette which is SO not easy to please. Many of my tomato soup attempts tasted like ‘ketch-up’ to her and she hates ketch up. So, when I tried this particular method, you can imagine me heave such a sigh of relief when the bowl was polished off in no time. And she comes back for more.. yay! That’s my girl! 2-3 garlic cloves, I used the fresh green variety with stalks. 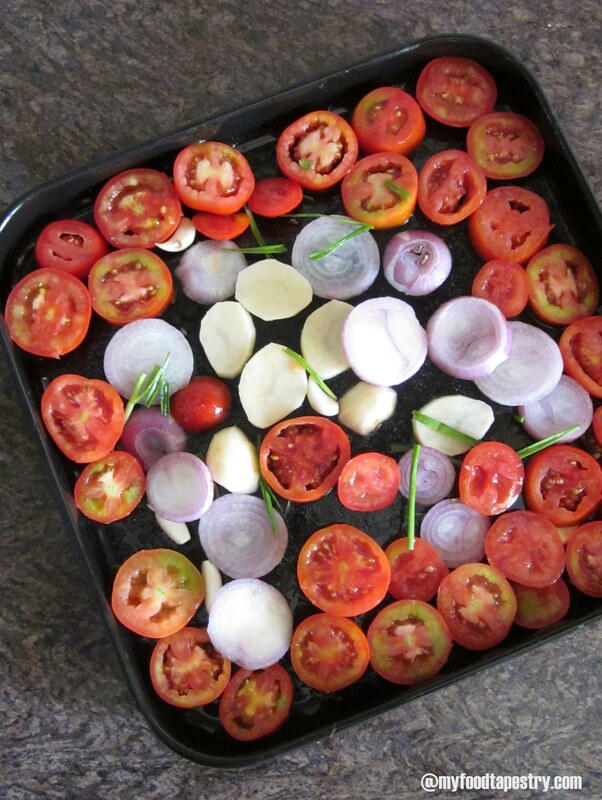 Preheat the oven at 200 C. Cut all the veggies in circles and arrange on a greased baking tray. Throw in the garlic pods too. Brush all with olive oil. Sprinkle sugar evenly all over the vegetables. Roast all the veggies for 15-20 minutes until roasted and browned. Turn the tray in between for even baking. Once done, remove. cool. Blend into a smooth fine paste using little bit of water. Be careful not to add too much water, else the soup will be runny. Run through a sieve. Boil again, check consistency. If too thick, add water or milk accordingly. Season with salt and pepper. 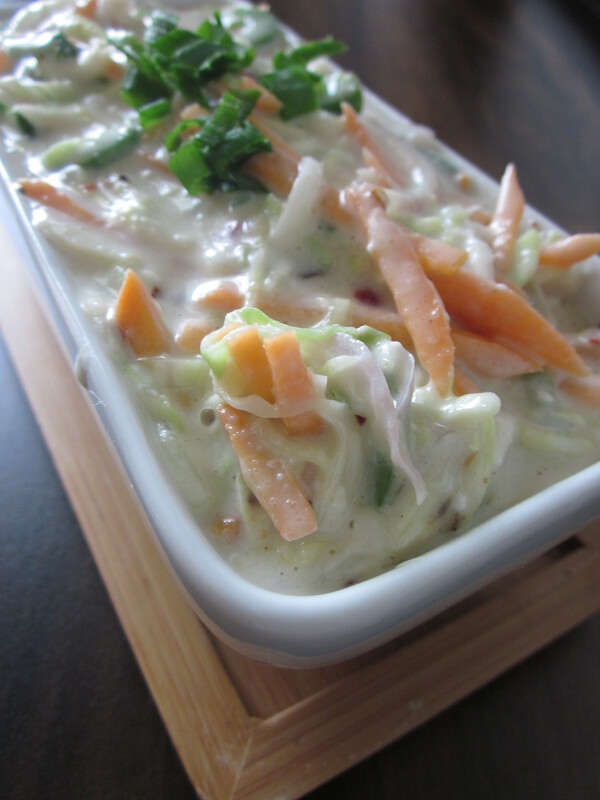 Serve hot topped with little cream or cheese. 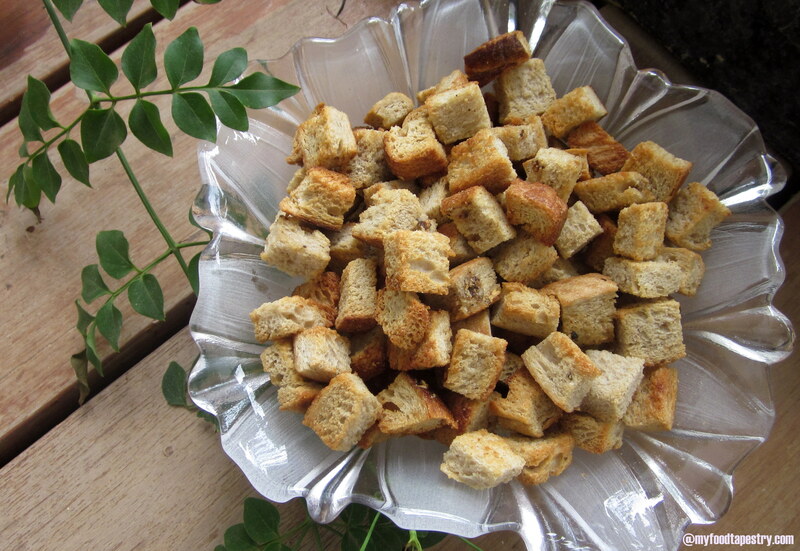 Best with: Croutons, bread sticks, crostinis or toasted bread. Note: For those who do not have an oven. Take a wok, heat olive oil in it, saute garlic, onions, potato and lastly tomato, sprinkled with a little bit of salt. Sprinkle some water. Cover and let it cook. Once done, proceed as mentioned in the recipe above. 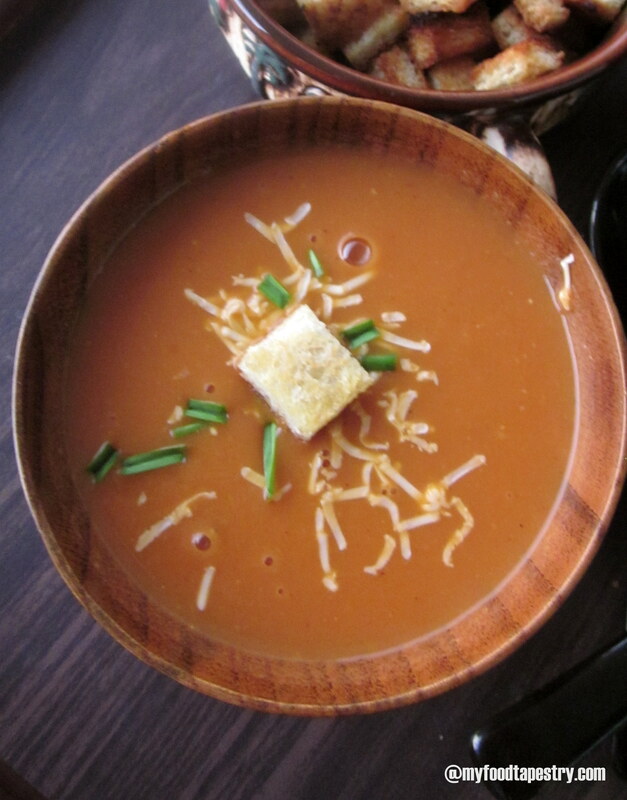 Note: The potato is added to give volume or thickness to the soup. 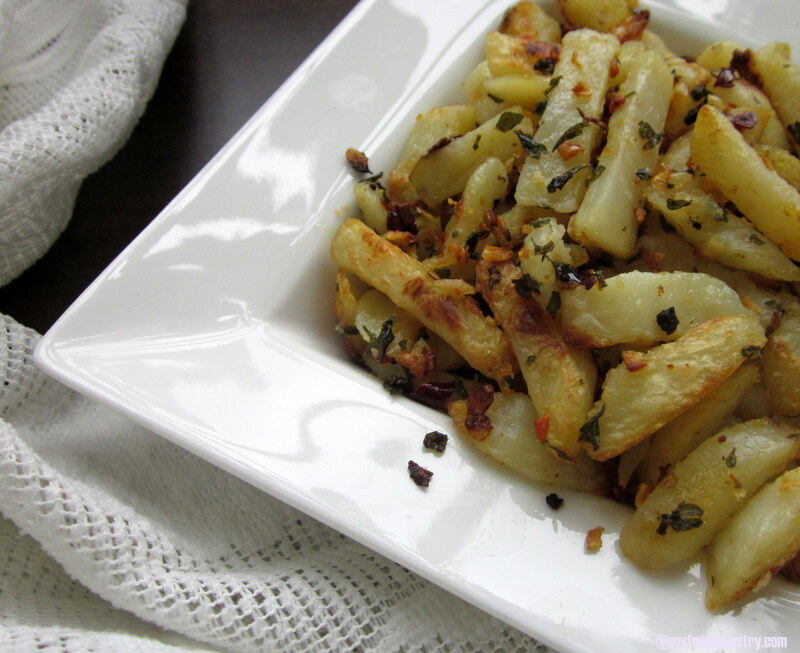 The addition of potato eliminates the use of thickening agents like cornstarch or flour in milk. 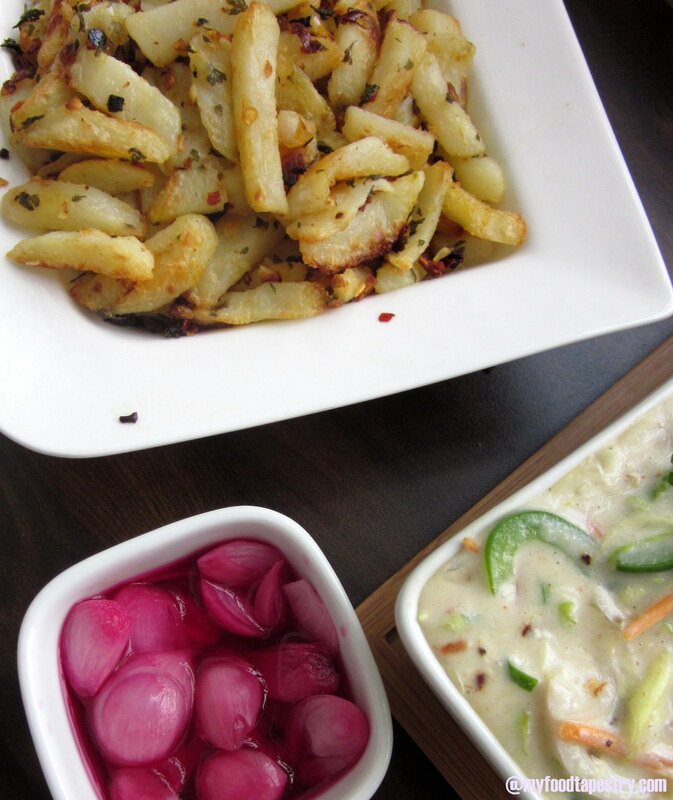 Note: The bits of sugar on the vegetables help in caramelizing the veggies. Note: To give extra kick to your soup, try adding one tiny green chili to the veggies on the baking tray. Spicy, salty, tangy and a little bit of sweet – all at the same time. Yummy! For those chilly cold evenings.. 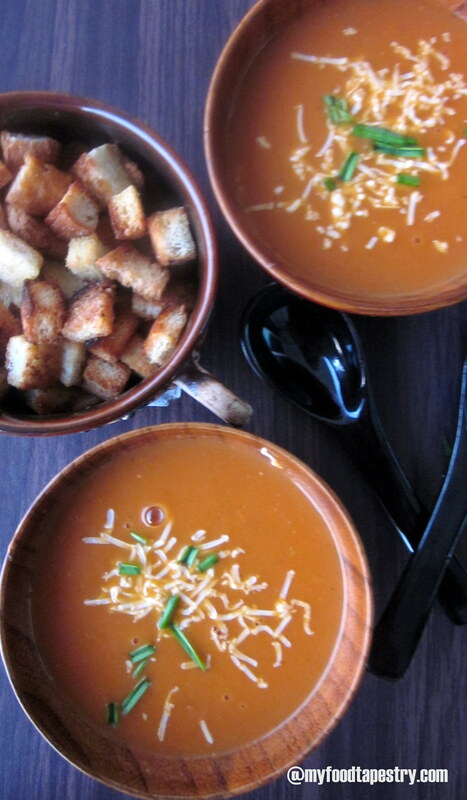 Chilly winters call for some of this luscious soup. So bake it. Make it. Lick it. Love it. Rakshabandhan – the bond of protection, is a beautiful Hindu festival celebrated with much fan fare and gusto in all parts of India. This auspicious day falls on the full moon(Shravan Poornima) of the Shravan month of the Hindu lunisolar calendar. The central ceremony involves the tying of a rakhi (sacred thread) by a sister on her brother’s wrist. This symbolizes the sister’s love and prayers for her brother’s well-being, and the brother’s lifelong vow to protect her. Wow, Right?!! My brother does not reside in the same city as I do. But distance never deters any sister to send this sacred thread across to her loving brother. A box full of cookies, some very dark chocolate brownies and fancy beautiful threads to adorn my little brothers wrist, I send these little beauties across and make sure the recipient gets it well in advance. A simple sacred red-yellow thread was the norm many many years ago. But now things have changed. 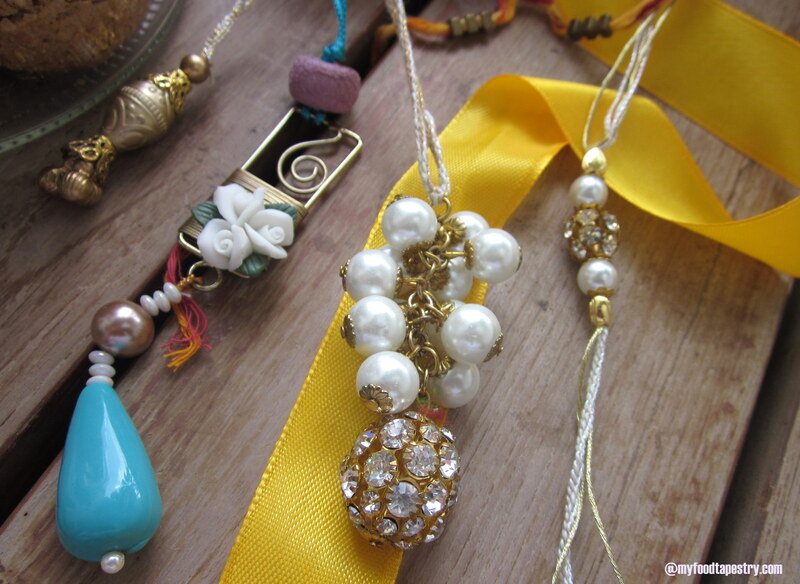 Indian market is flooded with designer rakhis which usually cost a bomb. They are visually very appealing, studded with stones and pearls. Mom always made sure we girls tied a simple thread first and then the fancy shancy ones which we splurged on. The thread adorned the brother’s wrist for days to come, where as the decorative ones usually came out within an hour or two of tying. So, what do you do if you don’t have a brother? Well, with changing times, this brother sister celebration extended even to sister-sister and brother-brother fanfare. Now, usually boys being boys never indulged in extra ‘frivolous’ things like these. You will never catch a guy tying any thread on another guy’s wrist, but what you will find is this – chirpy cheery girls tying the most decorative piece on their sister’s wrist. I know this, because that’s what we sisters did for a very long time, until my brother was born. 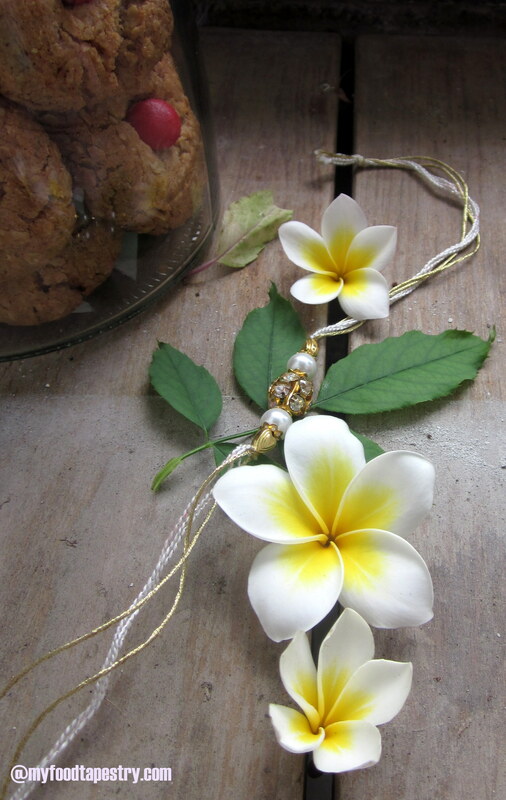 To this date, I send girl rakhis(called Lumbas) for my sisters and they love to showcase them on their bangles. Having such a small brother is like having a grown up son. He is smart, naughty, caring, witty and hates girl talk. Imagine him living his life surrounded by very talkative sisters, the kind who nagged, the kind who bullied, the kind who also gave in to all his wishes and demands. I remember him being my handy until I got married and moved away. He would run to do my work, but not before he bullied me into baking some chocolate cake or maybe a bowl full of hakka noodles. Sigh! Those were the days, now the stuff he wants scares the hell out of me – mobile phones, PSP’s .. and what not. 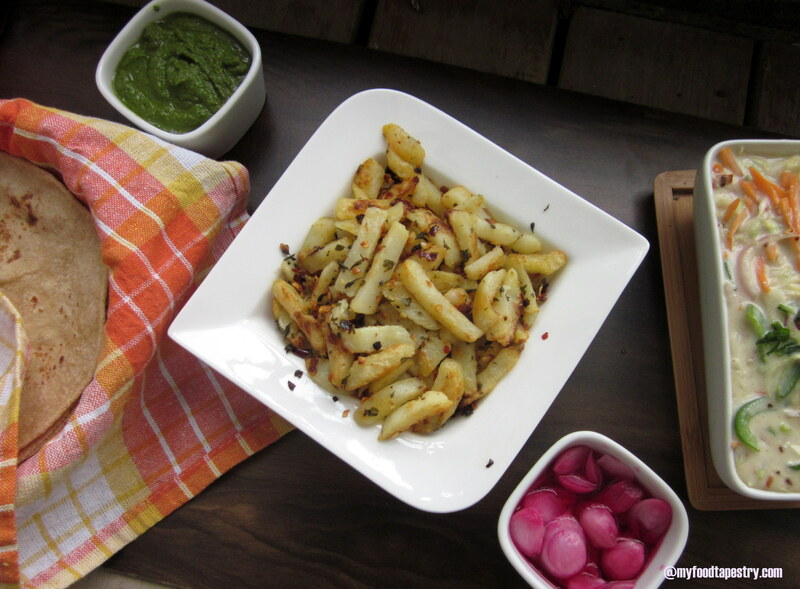 I made them crisp and crunchy. This year, along with the threads, I decided to send some good bakes as well. 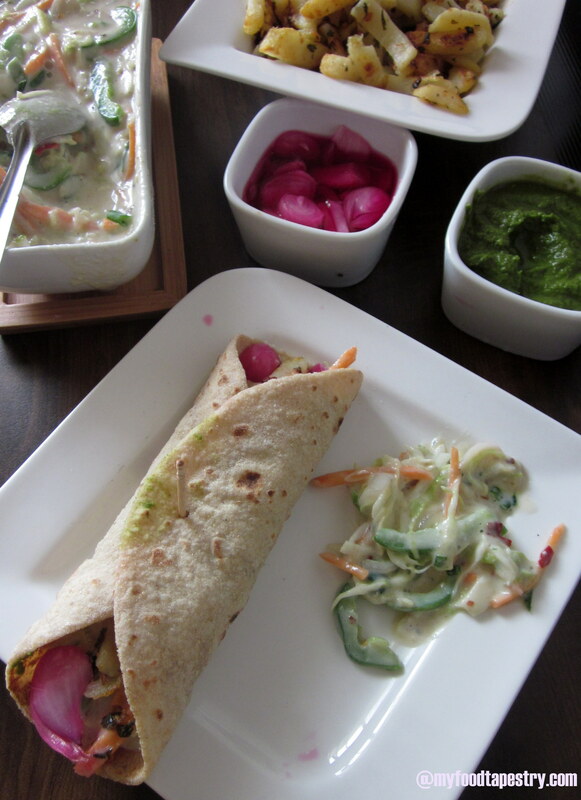 Its sheer joy when someone, anyone, sends you something hand made – home made. 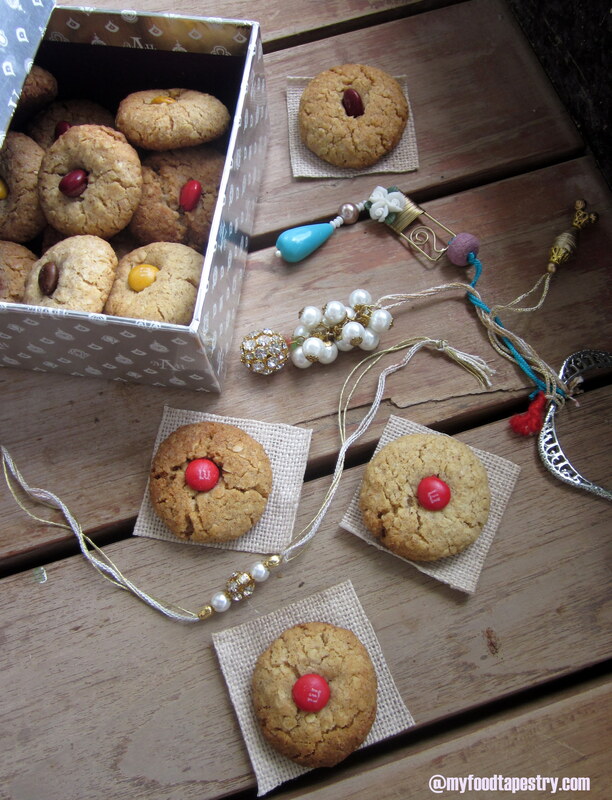 And the insatiable sweet tooth in my brother also gets satisfied with these sweet delights – yay! 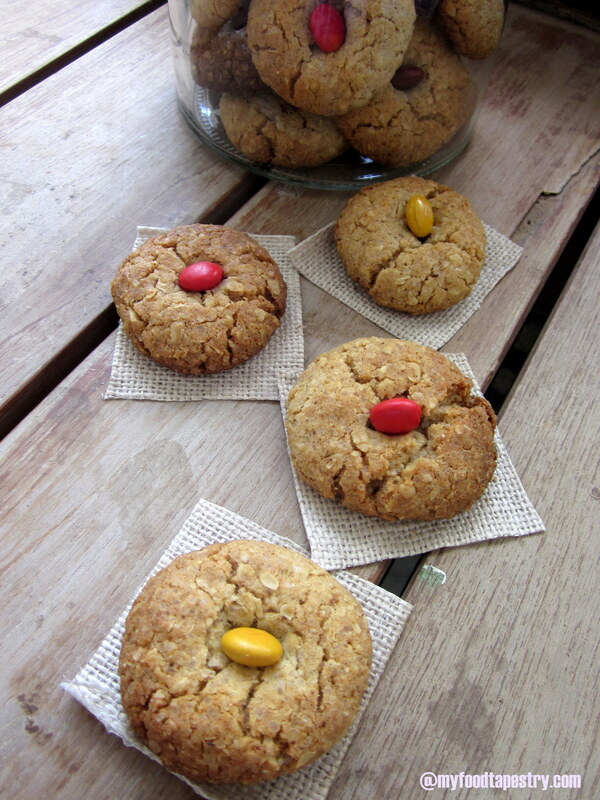 I’ve never baked cookies before, so when I came across this easy breezy recipe, I bookmarked it. 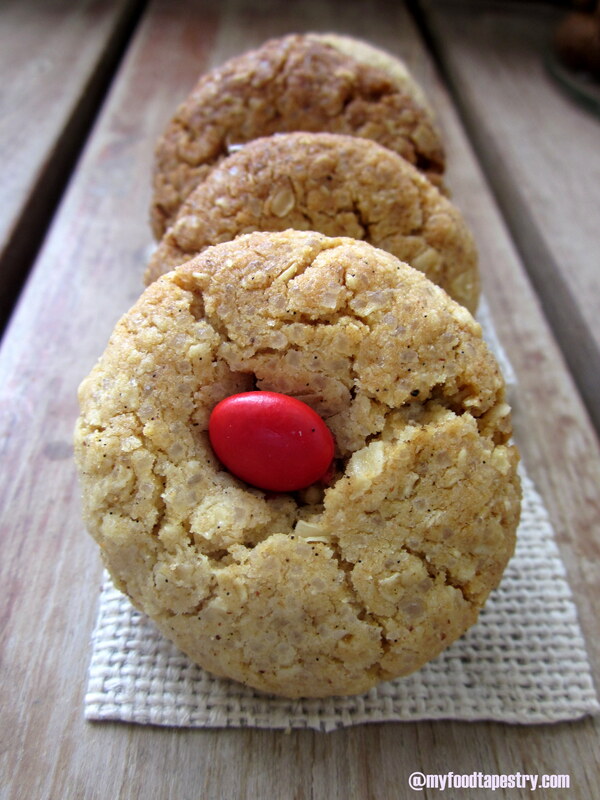 With the goodness of whole wheat and oats, laced with a hint of cinnamon powder and pure vanilla extract, these cookies were a big crowd pleaser back home. 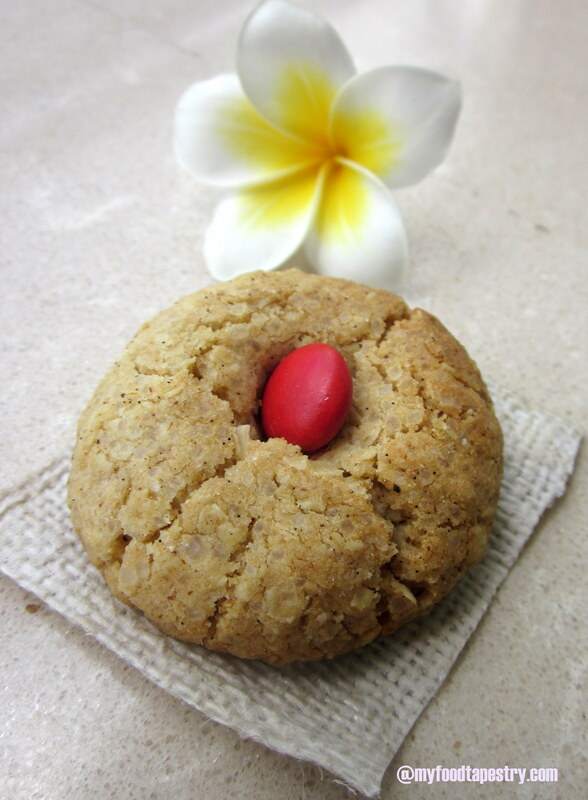 What we have here is an eggless whole wheat oat cookie recipe. They are dense, crisp and crunchy. If you prefer soft chewy bites, then simply bake them for a lesser time. 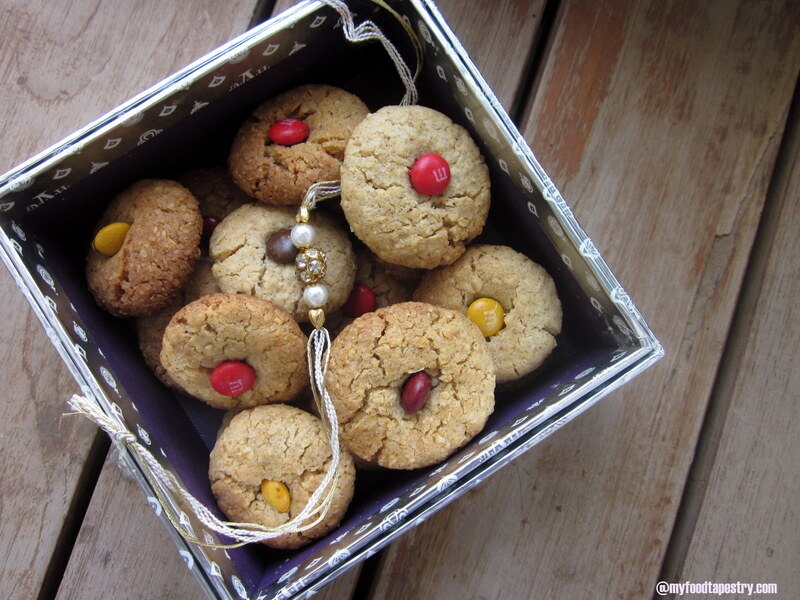 For lighter-fluffier cookies, use plain flour/maida instead of whole wheat. Beat butter, sugar, vanilla and milk until smooth and creamy. Mix all the dry ingredients, oats, flour, cinnamon powder and baking powder. Mix in the dry ingredients into the butter mixture and knead briefly until the cookie dough comes together. Grab small handfuls of the dough, and shape into small balls. Place on a greased or non stick cookie tray at a distance from each other. They will rise and spread. 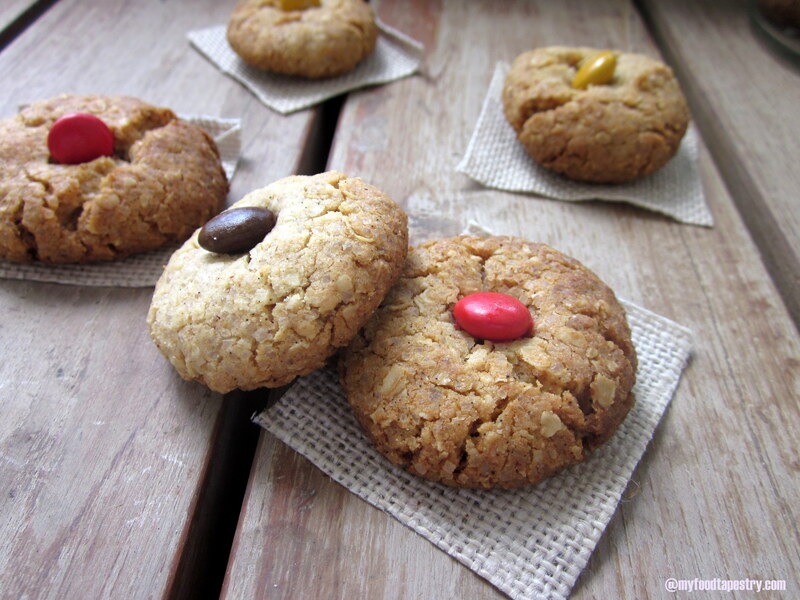 Bake @150 C for 15 to 20 minutes for a chewy cookie and 25 to 30 minutes for crisp cookies. To place the MnM/Gems: Midway while baking, wear a glove, place a gem each in the center of every cookie and return to bake. Once done, allow to cool. Sample if you crave a bite, and store in an airtight container. The brother pleased as a punch, hijacks the entire box, merely handing down a piece or two for the others to sample, relishes these sweet delights, calls me up and complains, “Why you didn’t send something savory to eat with all these sweets?”. No how-are-yous. No Thank-yous. No saccharine talk. Sigh! Brothers. 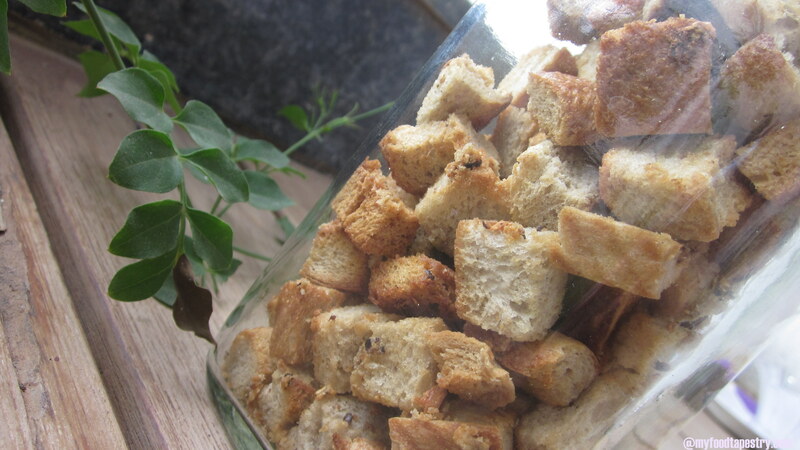 Bread Croutons – Garlic Flavored and Baked! It’s inanely easy. 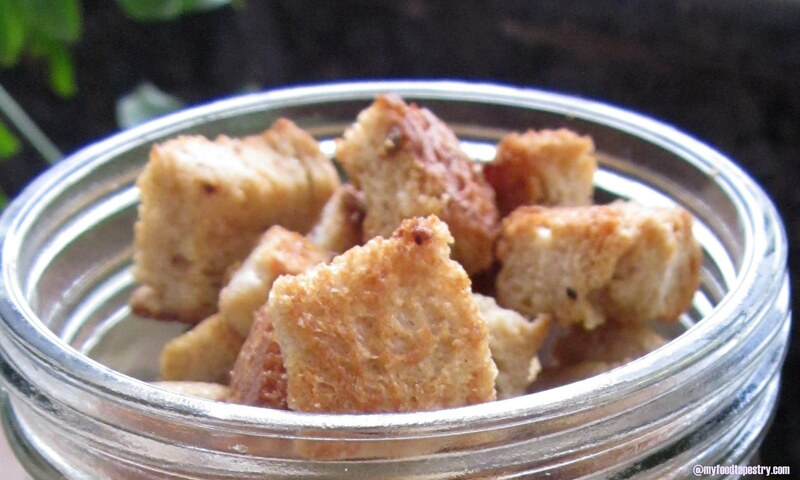 Really, making baked croutons is no rocket science. Pleasantly surprised by the simplicity and the crunch of the little bites, has coerced me to make several batches ever since my first. 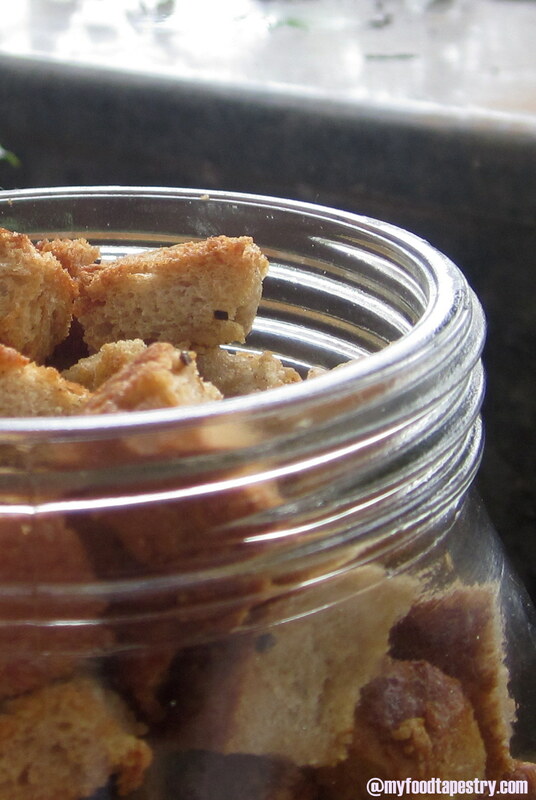 A french bread gives the best results, but leftover sandwich bread also would do. I had some whole wheat bread on my counter top waiting to be used. 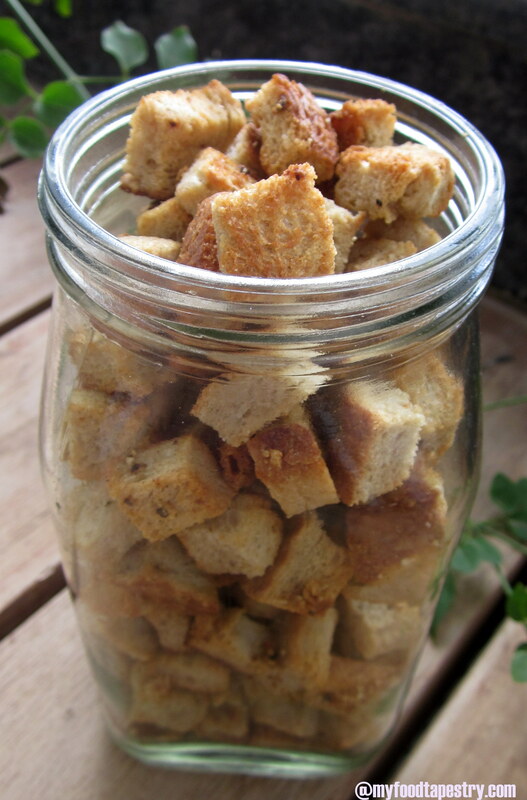 Just 5-6 slices is enough for a bottle full of croutons! They are great as add ons on soups/stews/salads or as it is. First time I tried these, no special flavors were added. Plain crunchy beautifully toasted they were. But I’ve been experimental. 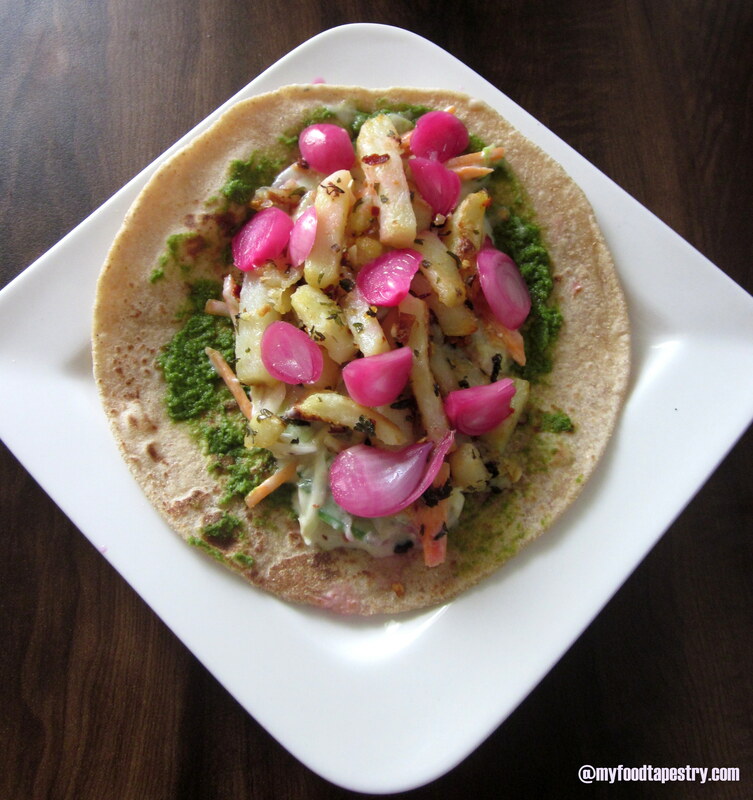 Pounded garlic and mixed herbs add such drama to the flavors…. you will be in for a surprise! 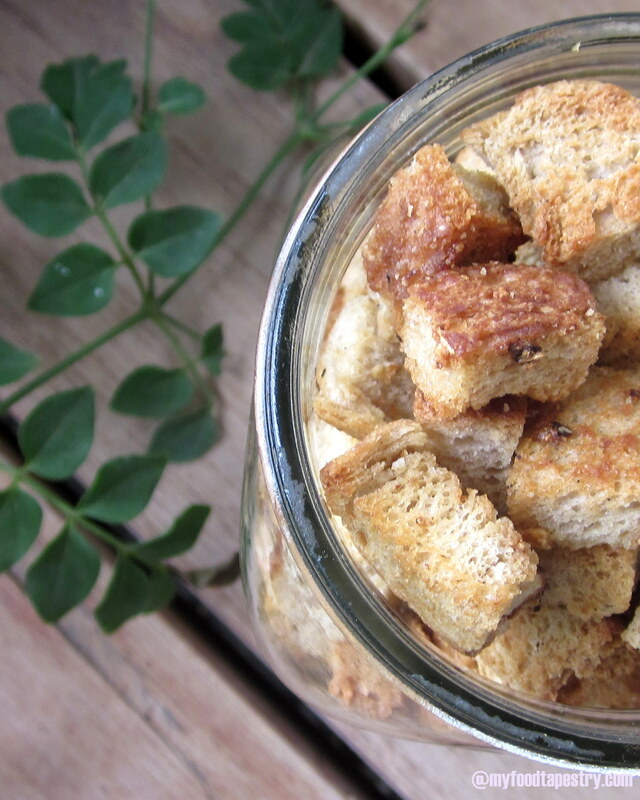 Use whole wheat bread, top with a little olive oil, add any flavoring you like and BAKE! See. So simple. And not to forget, HEALTHY too. Try munching on them with your evening cup of tea. Delightful. When you want some body to your salad, cottage cheese or boiled peanuts or croutons are the keys to a filling satisfying meal. Top these crunchies on your soup or stew, and relish the carb with the slurrp. Mix the olive oil, crushed garlic, pepper powder and salt. 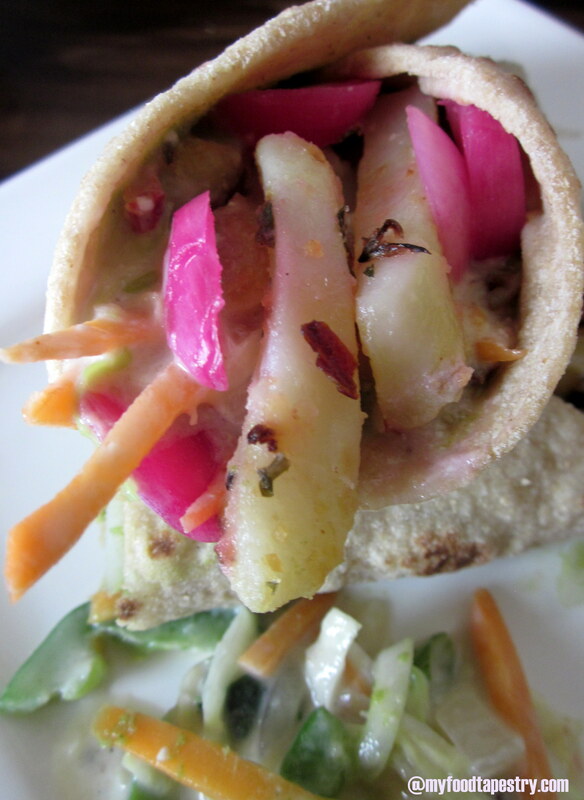 Gently envelop the bread pieces with this oil. 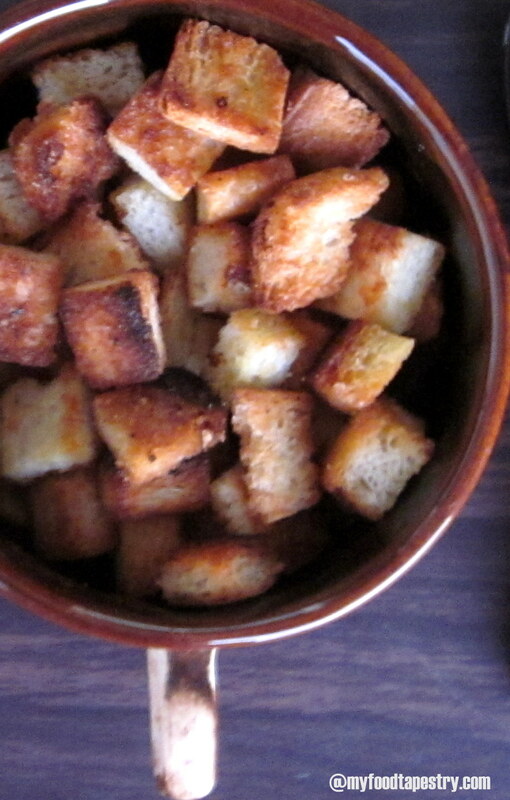 Spread the croutons on a baking sheet/parchment paper on a tray. Bake at 150-170C for 8-10 minutes, until they turn slightly brown and hard. They can go from brown to black like in no time, so keep an open eye. Once done, cool and store in an air tight container. Use within 3-4 days. 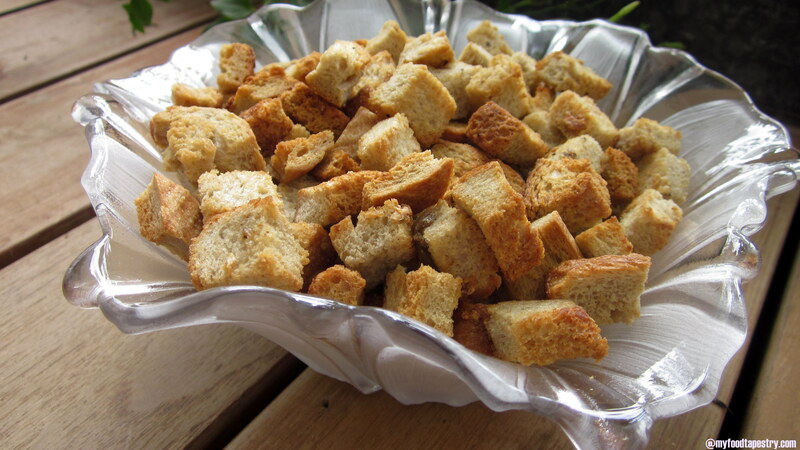 Use these croutons as sides to a dip! 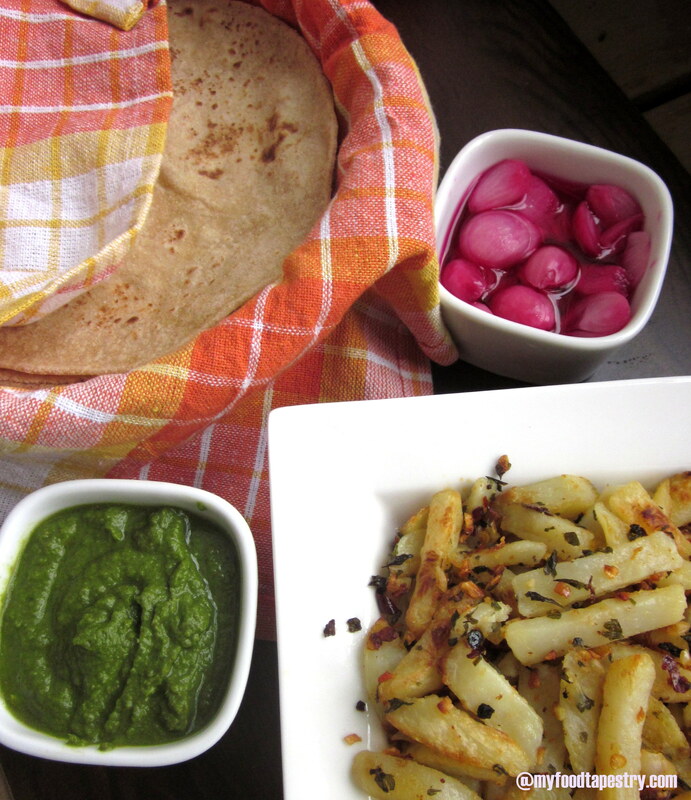 She mixed cheese spread and green chutney, made a light green dip. Dunked these bites generously into the beautiful hued spread and relished every bit. Kids! They come up with the best ideas.